Rome (AFP) - Italian Prime Minister Matteo Renzi announced his resignation on Monday, hours after it was confirmed he had suffered a crushing defeat in a referendum on constitutional reform. "My experience of government finishes here," Renzi told a press conference, acknowledging that the No campaign had won an "extraordinarily clear" victory in a vote on which he had staked his future. Interior Ministry projections suggested the No camp, led by the populist Five Star Movement, had carried the vote by a margin of almost 60-40 with a near 70 percent turnout underlining the high stakes and the intensity of the debate. Markets seemed to take Renzi's departure in their stride. Stocks and the euro fell in early trading in Asia but there were no signs of panic with the possibility of his resignation having already been largely factored in. Renzi said he would be visiting President Sergio Mattarella on Monday to hand in his resignation following a final meeting of his cabinet. Mattarella will then be charged with brokering the appointment of a new government or, if he can't do that, ordering early elections. Five Star founder and leader Beppe Grillo called for an election to be called "within a week" on the basis of a recently adopted electoral law which is designed to ensure the leading party has a parliamentary majority - a position Five Star could well find themselves in at the next election. "Democracy was the winner," Grillo wrote in a post-vote blog that marked a significant change in the party's position on the electoral law. Prior to the referendum, Five Star had been arguing for it to be revised. Most analysts see early elections as unlikely with the most probable scenario involving Renzi's administration being replaced by a caretaker one dominated by his Democratic Party which will carry on until an election due to take place by the spring of 2018. Finance Minister Pier Carlo Padoan is the favourite to succeed Renzi as prime minister and the outgoing leader may stay on as head of his party - which would leave him well-placed for a potential comeback to frontline politics at the next election, whenever it is. On the day Austria's voters rejected a far-right candidate for president, the scale of the No victory in Italy was even bigger than opinion polls had been indicating up until November 18, after which the media were banned from publishing survey results. Renzi had gone into the final weekend of the campaign insisting he could still win voters around but he acknowledged he had failed. "The Italian people spoke today in unequivocal fashion," he said. Opposition parties had denounced the proposed amendments to the 68-year-old constitution as dangerous for democracy because they would have removed important checks and balances on executive power. Spearheaded by Five Star, the biggest rival to Renzi's Democratic party, the "No" campaign also capitalised on Renzi's declining popularity, a sluggish economy and the problems caused by tens of thousands of migrants arriving in Italy from Africa. 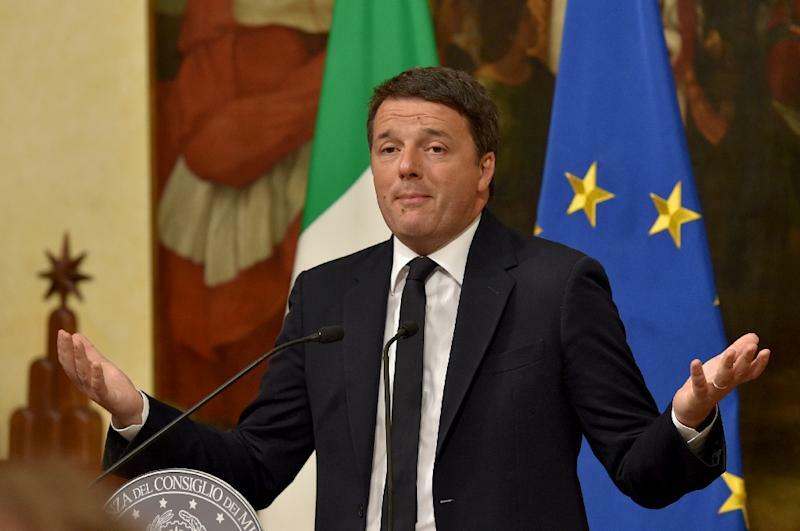 Renzi's backers believed they were voting for overdue change. 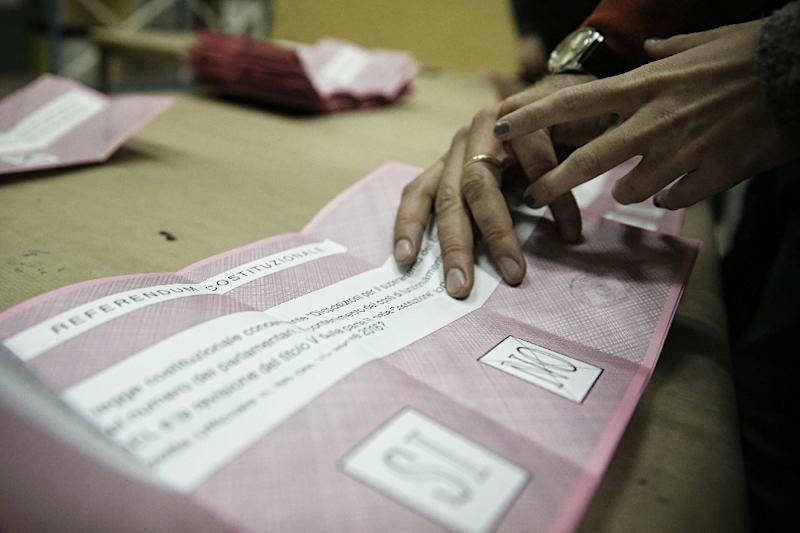 Outside a polling station in Rome, business owner Raffaele Pasquini, 37, told AFP he had voted "Yes" in the interest of his two-year-old son. "We are voting to try and change a country that has been stalled for far too long," he said. After the Brexit vote and Donald Trump's victory in the US presidential election, the No vote is likely to be interpreted as another victory for populist forces and a potential stepping stone to government for Grillo's Five Star. But the campaign was not just about popular discontent with the state of Italy. 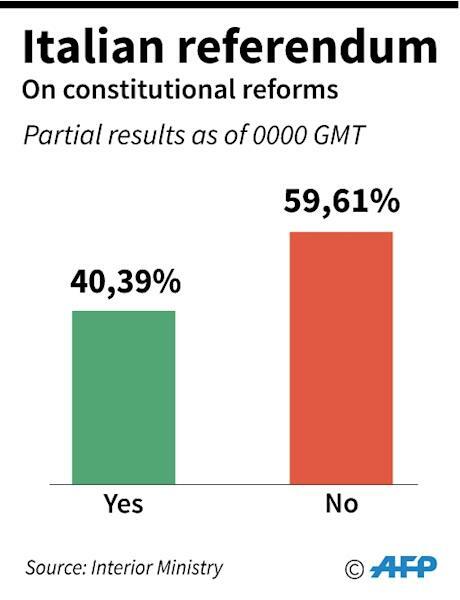 Many Italians of a similar political bent to Renzi had deep reservations about the proposed changes to the constitution. Under the proposals, the second-chamber Senate, currently a body of 315 directly-elected and five lifetime lawmakers, would have been reduced to only 100 members, mostly nominated by the regions. The chamber would also have been stripped of most of its powers to block and revise legislation, and to unseat governments.